What a smart girl! Love this! I love that American Girl is showcasing smart characters with big dreams! I just love this doll. I love that she wants to go to Mars, that she’s smart and driven. She reminds me a lot of my own daughter, who loves science and is just starting to love American Girl. My middle’s name is Lucy Ann. I know she would love this doll! I really like the background story. Awesome! Thank you for the giveaway! My daughter would love this doll!! Just requested the boook from the library. This is my favorite American Girl doll yet! I love how they are encouraging girls to reach for the stars. I would love to win this doll for my 6 year old daughter. My daughters would love this doll! Love that they chose an astronaut for GOTY!! This doll is beautiful. I love that she’s an astronaut! This company does such a great job promoting the stories of ALL American Girls! I would love this doll. My girl would LOVE her!!! Thanks for the opportunity! I love this American Girl doll because our girls need to have role models of bright, career minded women who can do anything they dream about. My granddaughter would love this because, at 7, she is an explorer of ideas & places. I love that the new American girl doll is Latina & that she has an interest in science. My daughter is obsessed with anything outer space and when she found out about this Americsn girl doll she immediately said she wanted one. This is a beautiful; doll, I would love to win it for my granddaughter! I hadn’t heard of this one yet, what a fun doll! I love that they’re making dolls that will give my daughter high goals! I love how American Girl dolls always have a unique story behind them! This one is a good one! I’d love this AG doll for my daughter! I love Her! She bears a strong resemblance to my granddaughter. My daughter would adore her! She has dark hair like hers. So excited for this doll and what she represents! She is so beautiful and just love that she loves space so do I! I so love American Girl dolls and this one is adorable. so cool! my daughter would love this. This doll is on my daughter’s wish list! She loves space just like Lucianna! I just love that American Girl Dolls are embracing STEM and it makes me excited for my daughters future. Thank you so much for the chance to win Luciana Vega! Love the STEM theme for this years GOTY! Thank you for the chance to win her!! I love the light up boots. 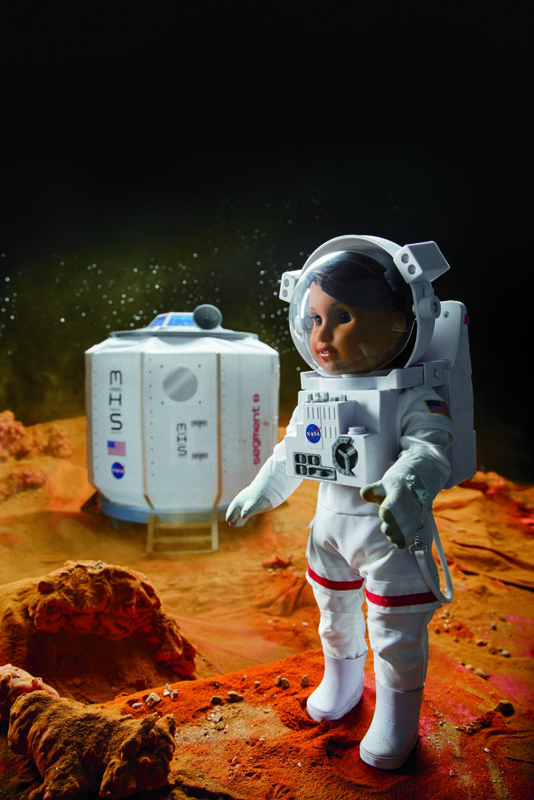 Luciana is a great doll to help inspire future astronauts. I love it. My girls love her! They are so interested in space and one may go to school for astrology because her goal is to work with NASA!! This is awesome, thank you. One little girl’s dream come true. Luciana is my favorite GOTY in a long time. I love her entire collection. My 5 year old would love her! I love this American Girl Doll. I hope that my daughter grows to be strong in math and science and I see Luciana as an amazing goal to aspire to. I was intimidated by math; my hope for my daughter is that she never is! I love, love, love this doll! I love that she is an inspiration in so many ways for my girls – a Latina, a scientist and breaking down walls in an industry that for years was predominantly run by males. I would love to win this for my 9 year old, but know that my 3 year old would also love her as well! Thank you for the chance to win! I absolutely love Luciana’s story! I would love to win for my niece. Thanks for a fun and awesome giveaway. These little dolls are really awesome. My daughters do not have one but their cousin does and my girls love it. I sure appreciate the chance at winning. Thank you! There are so many things I love about this doll. I think her interest in science is great way to show girls that they can do and be anything they want. Would it be okay if I donated this doll to a good charity if I won? We do not have a child in our household who would use this doll but know that there are many who would. I love her theme! Especially her Mars Habitat! She is definitely a doll a lot of girls can relate to! My three girls love Americans girl and love science! She’s perfect for our family! I have a couple young great-niece who would love this doll! Please and thanks for the opportunity. This is such a cool toy for my space-obsessed daughters! I love American Girl dolls! They always have such interesting stories…and I LOVE that this one wants to be an astronaut! How inspiring! Love the stories of American Girl dolls. Luciana is so inspiring! Great story for this beautiful and smart doll! Love that she is interested in science, great idea! My Granddaughter enjoys anything science related, she will love this doll. This doll has a great story! I love this doll ! Having 3 girls and all of them being science girls I love the NASA aspect of her! What a beautiful doll. Love the story behind this doll. My niece loves the American Dolls. I love that she is inspiring and encouraging!! All girls need this in their life one way or another! She is gorgeous. What an awesome doll to be a role model and inspire girls to think big! This helps promote the STEM and STEAM programs, especially for girls. Thank your for awesome chance! My daughter would be so thrilled. She is beautiful & smart too! My daughter would love her ~ thanks for the chance! So many women are inspiring our young girls today. Thanks to American Girl for helping to reach for the stars! My daughter loves her American Girl dolls. My daughter just recently discovered American girl and I know she would love to have Luciana. I love that’s she into science- female scientists have to stick together. This is one of my favorite AG dolls yet! I would love to add this gorgeous doll to my little girls collection! She’s a really pretty doll, that any young girl would be blessed to have, I would probably save her back for next year’s Christmas & donate her with some clothes to a girl Angel tree recipient. What a great doll. Would love to win this for my bff’s daughter. I love that they finally made a modern Latina doll! Such an inspiration and role model for young ladies! What a perfect Girl of the Year! Inspiring to have a science-focused one. Would love to give it to my twin daughters. I love that she loves science. My daughter would love her. My 7 yr old granddaughter would love this doll, it looks like her! My daughter was so excited when she saw this doll. She’s beautiful and I love that she wants to be an astronaut. I like the American Girl dolls. Thanks for the giveaway. 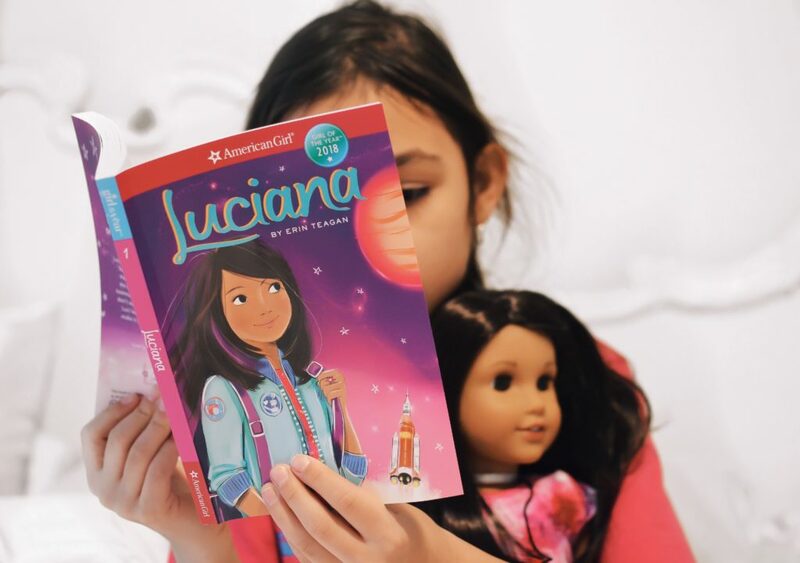 American Girl has always created great role models for my daughter and Luciana is no exception. Marvelous doll! My 4 year old grand daughter would treasure her! They always come up with the best American Girl dolls, our girls fall in love with them. This doll looks great. I’m so happy they have a girl with a love of science! Love the American Girl dolls. What a wonderful way to inspire children ! what a dream for a lil girls to want to be an astronaut…GO GIRLS !!!!!!!!!!!!!!! This is a beautiful doll. Adorable doll! Never had one of these before. I am in love with this American Girl doll. What a wonderful message for young girls!!! Great giveaway. My granddaughter would love to have a real American Girl doll! My daughter loves American Girl, She does not have a doll but she enjoys the books. She is so pretty. I love how inspiring she is, and her outfits are just adorable. Thank you very much for the chance to win! My daughter is already in Love with Luciana. I just made a new friend who is from Chile, and I am so excited to show him this year’s American Girl Girl of the Year! My daughter would love this doll and learning about her story. She is such a pretty doll. The world needs strong models for all girls. I would love to win Luciana Vega for my daughter. I love all that she stands for and shes a positive role model for STEM education for girls. What a beautiful doll! Love American Girl! These dolls are so pretty!! My daughter would love to have one!! I always wished I could have an American Girl doll when I was a kid. I liked how the older dolls showed more historical characters and how they’ve modernized them now to show role models for girls. I grew up loving American Girl Dolls. I love how they have continued to show strong females in all their dolls. We love American Girl Dolls! I would love to get this amazing doll for my niece! my daughter would love to have her own american girl doll! I really like all things American Girl. My daughter has always wanted one of these dolls. Thanks for the chance to win one for her. American Girl is a great idea! I just love her dress. I was really into astronomy when I was a kid. This would make a very nice gift. Such a beautiful doll. Thanks for the giveaway. I love her story, and her outfit! She’s beautiful! My daughters would love her! My 6 year old would be excited to get one! My daughter LOVES AG!!!! Thanks for the chance! My granddaughter loves the American Girl dolls. This doll is so cute. Thank you for the giveaway! What an awesome doll! The space-pattern dress is really cool. The doll is so adorable I know any little girl will lover and have a new friend for life. My niece would love this – the littel girl is a lookalike. I would Love to win for her! I love the emphasis on science! This doll is great, I would love to win it for my daughter. What a beautiful doll, and I love her dress! Both of my daughters have been big American Girl fans! I absolutely love this space theme. Great doll, my daughter would love this. ANother adorable doll. Any little girl would love her. We love American Girl dolls.hey are well made and I love the books that go with them. Beautiful doll. Would love to give this to my niece! We have been American Girl Doll fans for years now! My children had a couple of dolls and now my grandkids are fans. These truly are beautiful lifelike dolls! My daughter just learned of American Girl dolls, and would love to have one. I appreciate that American Girl is showing girls that there is no end to what ANYONE can do – it is through the power of desire that we will get to where we want to go and do the things we want to do – nothing worth doing is necessarily easy – but we can all achieve the unbelievable if we work hard and stay focused! This doll is awesome I love that she has an interest in science! My daughter would love her! My 10 year old daughter would love to win her! The American Girl dolls keep getting prettier! My granddaughter Addison would love this doll! I’m thrilled with their choice. Very empowering! This is my favorite girl of the year so far! My daughter would love to have her. Love AG dolls! This girl of the year sounds amazing – and with big dreams! My daughter would love her.. She is such a cutie! Beautiful doll with lots of fun accessories. I can’t wait to get my daughter an American Girl doll. She’s still a little young, but I’d happily store one away for her if I won. This is a beautiful doll. I have lots of girls in my life who would love to have this. I loved the American Girl doll series when I was a child. I received the catalogs and remember picking out my favorite girl with all of her accessories (Molly!). Now, my daughter is 7 and she is also a big fan of the books and the dolls. She is absolutely so excited about Luciana! She’s beautiful! my daughter has always wanted a American Girl doll! This doll is samazing and would be a great start to her first american girl doll collection! I would love to win an American Girl Doll for my niece. I love American Girl, my granddaughter would love one too. She’s so cute, i love her galaxy dress! She is such a pretty doll. I love that the American Girl dolls encourage girls that they can do whatever they want in life. My daughter has the Saige doll and absolutely loves it. My daughter looooves to look through the american girl doll magazines. She would love this! My daughter loves these dolls and i love the message that they send. My youngest daughter would love this doll for her birthday next month! Luciana is a very inspiring doll. Great job American Girl! what a cute doll this one is! Thanks for the giveaway, Id like to win this for my friends little girl. I’m so happy my 11 year old still lives AG! I love that little purple streak in her hair. So unique and fun. I love American Girl Dolls. They do such a good job of combining play and learning. I love the idea of a of a new focus every year. You wouldn’t necessarily have to buy a new doll every year just the books and accessories. Such a pretty & inspirational girl! I would love to win this doll & book for Xali, my friend’s 5 y/o daughter. 🙂 Thank you. I love the science theme of this doll. Oh my! This would be a perfect addition to my granddaughter American doll family! Luciana is an excellent choice for the doll of the year — a great role model for little girls. I love it that there is a new doll of the year every year! My daughter just loves American Girl dolls! What a gorgeous doll! My daughter would take good care of her. I love her story, it really helps showing girls that having a dream is good, and if you work hard it will progress into something good. Another American Girl Doll Classic! What a beautiful doll with a great story! I love her story! As a female scientist and former Space Camper I think she’s perfect!! I love that Luciana Vega is an astronaut. What a great inspiration and role model for little kids! I love the dress and awesome shiny boots that come with her! I have always wanted one of these dolls when I was younger but I never got one. I’m glad they still have them around now that I have children of my own! I never really lost the interest and still get the catalog! My niece is battling leukemia for the second time and she would be thrilled to have a companion to her every three week chemo therapy. Her hair is all gone and I’m sure she would have a blast playing with this cute Dollie. I would love to win this for my daughter and I am such a fan! I love that American Girl is giving girls big dreams! I love the historical stories behind American Girl dolls! I’m a stem girl myself so I love this. Adding stem girl with American girl is awesome. Would absolutely love to have this. My daughter would love one of these beautiful dolls they are all so pretty. I love American Girl Dolls. My granddaughter would absolutely adore this doll. Her dress is so cool! My daughter and I love Luciana. Her collection is so awesome. She has inspired us to learn more about outer space. We have seen a million videos on YouTube about planets, stars, nebula and everything galactic. We can’t wait to bring her home one day. Her space suit and Mars Habitat are the neatest things AG has ever made. Thanks for hosting this awesome giveaway! Love (LOVE!) the STEM emphasis!! My girls both love American Girl dolls, and the academic piece really makes this doll special! Thanks for the awesome giveaway! I am really excited to get my daughter an American Girl doll for her birthday this year. I love that Luciana is into space 🙂 My daughter would love her! I love that she’s an astronaut! What an interesting new doll. I love the American Girl dolls and books, would love to have one for my granddaughter. Though I was aiming for a history character, I think her purple hair and spacesuit got my daughters attention. So we’ll see. My niece was SO excited to see this girl of the year. She absolutely loves science and has decided she wants Lucians and aaaaalllll of her collection. Hehehe! AG did a fantastic job bringing in all of the science/STEM/NASA items! Love that she’s into space. Her astronaut suit is awesome. My daughters would love this adorable doll! I love this new doll! She is so pretty! Wonderful story behind this doll! I hope she inspires an entire generation of girls. I love American Girl. They are such positive role models for our kids. Oh she is so precious! Kayla would love her! I love the purple in her hair! They do such a great job with each new doll they make! So much detail and so educational! What a great backstory for this doll! Thank you so much for such a lovely giveaway. My little girl would love this doll. I am always teaching her that she has the potential to be anything she wants when she gets older. This is such an inspiring AGD! My daughter would be honored to be a proud owner if I won this and gifted her with it. I love watching how the AGD brand has positively impacted girls for many years now! My daughter, Amira, fell in love with Luciana the day she was released! I love that AG fosters diversity and allows girls to dream big! What a great doll! I love her story and how inspiring she is for young girls. Luciana is the best doll of the year so far. My daughter would love her own! I would love to win this for my daughter! She adores AG dolls. Thanks for the chance! My daughter saw this doll and. Was egging for her, she doesn’t even play with dolls much. She is such a beautiful doll, and I love that it shows you can do anything. I would love to win this doll ,it would be my youngest daughter’s first american girl doll ! I always begged my parents for an american girl doll when I was little and never got one! Now my daughter begs me for one. Would like to get her one soon! So thrilled about Luciana being the new AG doll. My six-year-old is saving up to get her, but it is going to take a LONG time. I’d love to surprise her by winning this! My daughter loves STEM and would love to win Lucianna! I think my niece would love Luciana. Thanks for the chance to win. My daughter has been really wanting this but I just can’t afford it. She’d be so so excited! I never knew how much work and attention went into making an American Doll, all I can say is wow! To have a NASA chief scientist involved is awesome. I know whatever little girl receives her will just love Luciana. I love the American Girl brand! The brand inspires girls to follow their dreams. This doll reminds me of my Niece who loves to add her own little personal twist to everything. Love that they worked with NASA on this… .little girls CAN aspire to explore the galaxy! My niece enjoys American Girl dolls. These are amazing dolls. My daughter has grown up with them. I love the quality and uniqueness. My daughter has been begging for an American Girl Doll! Yea! Finally showcasing girls with a purpose! Thank you for this. I love how American Girl is creating these awesome characters that girls can relate to and strive to be like! Great role models! Love American Girl dolls, so precious!! I love that she is a smart girl! It is a relief to finally see toys for girls in careers different than teachers and nurses. Its also nice to see she has a funky, less traditional style. This doll is gorgeous! We do not live close to an American Doll store or anything but my 6 year old daughter would love one. We are crossing our fingers on this one, she is amazing! I love this new American Girl doll! I think my favorite thing about her is that she is an astronaut, space has always been very interesting to me. 🙂 I also LOVE her dress, I wish I had one in my size to wear. She is an awesome doll— thaks for the opportunity. FYI, the Pinterest link in the giveaway isn’t working. It says board not found. My daughter would absolutely love this! We were just talking about visiting NASA when we go to Houston to visit family. I love these dolls and what they stand for. I love that this one encourages girls to love Science and Technology! I love the American girl dolls! So many types of dolls! What a pretty doll. My granddaughter would love this doll. I love that american girl embraces real like subjects and encourages girls to dream big!! What a cool doll! My girls would love her! I love my American Girl growing up and I still have her. The lil one loves American Girl Everything lol. I think any child would be thrilled to get one. This doll is perfect for my niece. Baby Girl just got her first American Girll DOll, Maryellen from the BeForever collection and we went to the AG cafe in NYC! I loved learning about all the dolls and totally fell in love with this brand for my daughter! I love the stories of each of the girls. My niece L O V E S these dolls. I like the fact that they are so inspirational to young girls. They are presented with themes for each one and the way the children build on that expanding hopes and dreams in their young minds is truly AMAZING. It really enforces that their imagination can really be a possible reality. I would love to win this doll for my granddaughter. She loves American Girl dolls. I would love to get my daughter’s one of these. My daughter is just now getting into American girl dolls. I really wish I had saved mine from years and years ago! My friends’ daughter is just getting to the age where she’d really appreciate a nice doll like this. I love the story that goes along with this doll. My daughter would enjoy this prize. Love the NASA/Space theme as family members work there. My daughter would love this doll. The dolls name is also important to her. this would be so cool for my granddaughter who lives in huntsville, home of u.s. space and rocket center! We have some of the older American Girl Dolls from Pleasant company. Love how they have moved into the Future with this doll… Amazing! This seems like a great girl with an amazing story! This girl is beautiful with an inspiring story. What a great giveaway. We are huge American Girl fans in our house too! My Daughters name is Luciana, she is Puerto Rican, I want to show her that she can do anything! She has a really cool dress! 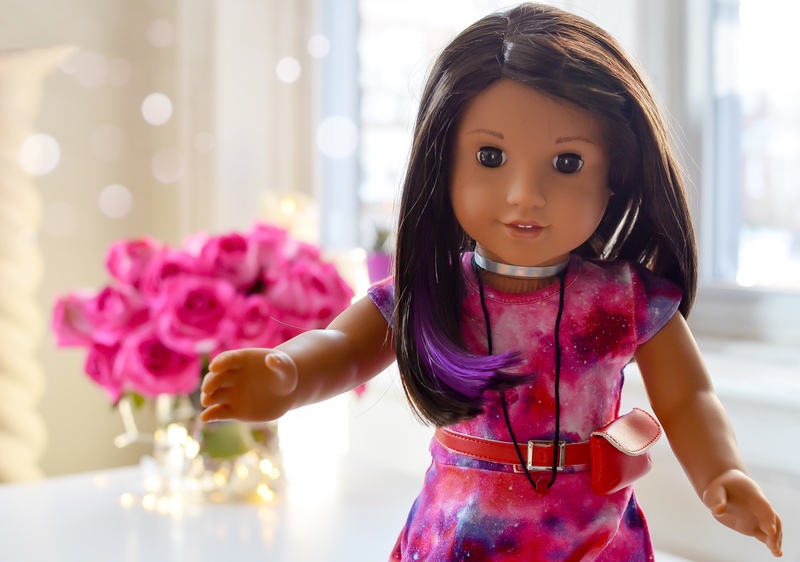 I have not heard of this doll before Very interesting that “American Girl collaborated with an advisory board including a NASA chief scientist and astronaut.” I like the purple touch to the hair, simply stylish. I love how she shows girls they can do anything they want! I would love to win for my niece, Bianca who loves American Girl. this is my very favourite american girl yet, and my daughter REALLY REALLY wants on! I love this doll, I would really like to win it to give to my niece. My daughters would love her! She is smart and pretty! I like how she is a good role model for girls. My granddaughter is loving her Bitty Baby doll – can’t wait for her to discover “older” dolls like this one, her Mom’s Samantha doll and her aunt’s Josefina! I have always loved the American Girl dolls. However; Luciana is my favorite of all of them. I think it is marvelous that she loves science and space. She has a cool name to go with the cool purple streak in her hair. This would be a wonderful gift for my niece. She is a huge American Girl fan. My granddaughter is finally old enough for this doll. She loves American Girl dolls. I love that this doll encourages young girls to study science. Love all of this! Hoping to give my daughter an American Girl doll for her birthday! I’m a children’s librarian, and I would love to win this for my library. We just bought Melody to start an AG doll loan program. (The program will launch this month.) Luciana would be such a great addition! This is a beautiful Amercian girl doll that I would love to win! I love that this American Girl doll is an astronaut. She would be perfect for our daughter. thanks for the great chance. My first granddaughter adored her American girl, the second was kind of a tomboy and the third would love one of them. What an awesome giveaway! I love American Girl Dolls. I love this newest addition to the American Girl line. My niece would be thrilled to own this doll. Thanks. I love that this doll includes STEM accessories. My daughter loves American Girl and would love this new set! Thanks so much for the chances to win. Just absolutely beautiful! I love that the story uses science, writing, and creative thinking to award a bright, young mind a trip to space camp. Wonderful. I’ve tried finding a good used one with no luck. I have 30 niece’s/nephews and great nieces/nephews so I try to stay as equal s I can on each.. However; if I win.. She IS getting this doll! She can pass it on to her little cousins when she gets too old or whatever she wishes. I feel a child that holds on to a wish or dream this long… needs it met. Most kids bounce from character to character with the trends but she’s stayed true to what she wants! What a pretty doll! She’s a doll any girl would be proud to own. I love how encouraging the American Girl dolls of the Year are! Our Samantha would love this! She even has the dark hair. My Daughter so wants this! Such a pretty doll. My daughter loves this AG doll. She is smart. I would love to win this doll for my 11 year-old niece who has never had a “real” American Girl doll but would LOVE one! Thanks for the giveaway! I have 2 granddaughters now and would love to start collecting American Girl dolls for them! I love American Girls! My niece loves hers so much. Thanks for the fun giveaway! These beautiful dolls & the stories with them are amazing! They will help our little girls become more resilient, learn how to succeed in their lives, but also teach them we don’t give up in any failure but try, try & try again. These dolls stories will teach little girls how to lead & become champions! Love these dolls with their stories! What an adorable doll! I love the space theme! Would be a dream come true!! I really think it’s great the their dolls come with a story & a life goal. That can do so much to encourage young girls. What an amazing doll and story. So wonderful to see dolls and toys like this for girls and boys today! So glad AG has made a science-loving doll – FINALLY!! My daughters would love this American Girl doll! So awesome! My daughter would love this! I always wanted an American Girl doll of my own when I was a a kid! If she really had ambition, she’d have dreams of being an astronaut and the first person to set foot on the sun. This Luciana doll is absolutely adorable! My granddaughter would love this. My granddaughter wants this doll so bad. Fingers crossed. I love this Latina doll! How important is it to embrace all of our Country’s amazing cultures! I would be proud for my daughter to play with this Beautiful doll. My daughter is just getting into American Girls, she would love this! This is a great doll for kids, to encourage the love of learning and pursing exciting dreams. My granddaughter would love to have her. My girls would LOVE this love how American girl encourages us to dream big! I would be thrilled to win this doll for my granddaughter for her birthday coming up! My niece would love this for her upcoming birthday!!! She is an inspiring and totally cute looking doll! wow, love it. this is fun, and first time i have heard of her actually. I would love to win Luciana for my daughters! My nice would love this doll. My daughter has been begging for this very doll for her birthday. She wants an American Girl doll so badly. My youngest daughter would love Luciana, she has one American girl doll right now and she definitely wants more…lol. Thanks! She’s a cutie. My granddaughter loves the fact that she’s an astronaut and about her age! Winning this would be awesome! Not only is Luciana actually my granddaughter’s name, this American Girl doll is a wonderful role model for her (and other girls). What a great inspirational doll for our girls! My 2 daughters would really enjoy playing with this doll. My daughter loves American Girl dolls! I love that these dolls are really role models for girls. They are so unique, have their own personalities just like our little ones. I love the coloring on this doll, she’s so natural looking. Very realistic! My daughter would love Luciana!! Amazing giveaway! Thanks for hosting this. My American Girl obsessed niece would love this. This is the most precious American Girl. I would love to gift it to my niece for her birthday. I love that American Girl is doing an astronaut. We need more women in STEM fields. Thank you for the awesome contest. My niece would love this doll. I love the inspiration and positive image this doll conveys for young girls today. I love this doll. A doll that my granddaughter would surely adore! I have 2 granddaughters that would love her and we live close to the space coast so would reinforce some of our visits and things we learn. My cousin would love this doll. I love the American girl dolls and stories. They are so optimistic and encourage them to go after their dreams! This is my daughters dream doll! This doll is beautiful! My girls would love her so much. I love that she is into science! My kids would absolutely adore her! My niece has wanted an American Girl doll. Luciana is a doll that teaches girls to set goals and reach for the stars. I love American Girl Dolls (who dont right?) Look at this doll!! I know four little girls who would love her with all of their hearts and souls. I love everything about her accessories, hair, shoes, and eyes. I adore American Girls! I am excited to see them branching out and becoming more modern and inclusive. Every little girl wants an American Girl doll. This one is really a role model. My niece also is interested in space, so this doll would be a win, win for her. It would surely make me a popular auntie also. I love this Luciana Vega All American Girl Doll. My daughter would absolutely want her as she is into learning all about Science and space. I love that American Girl Dolls inspire girls to follow their dreams no matter how big. Love the American Girl dolls and the value’s they represent. They are great roll models for our young ladies. My little girl would love her dress. It is so pretty. We are huge AG fans!! Luciana is adorable. I love how they are encouraging girls to reach for the stars. My 5 year old grand daughter would just love this doll. It would be her first American girl doll. I LOVE Luciana! How encouraging to my girls to dream of being an astronaut. She is beautiful and we would love to win her! She looks like a very unique doll. I know my granddaughter would love her. Thanks! Great doll, with a great story! A doll with a lot of intelligence! Great Job! My granddaughter would love her. These dolls are all so beautiful, my granddaughter would love any of them. I love that they all have something exciting about them. She is a good example for youngs girls growing up to aspire to the highest levels when she is dressed in her space suit. 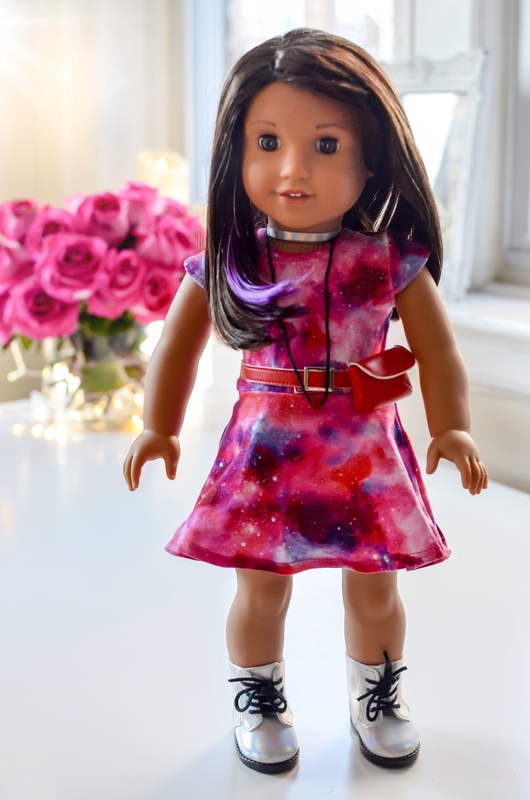 As a Latina girl who loved science as a kid, this doll warms my heart! I would have loved this as a kid! I would love to share this doll with my nieces! My daughter keeps asking for an American Girl Doll! I would love to be able to give her one. Nice to see that dolls are more culturally diverse, also good to see dolls being more of a positive influence to young girls and lets them know that anything is possible, you can be a great artist or an astronaut. Great inspirations for the girls!!! My daughter will love this doll!! This is a beautiful doll, boldly going where no other American Girl doll has gone before. My daughter loves Luciana because she is astronaut. My daughter loves learning about space. Thanks for the wonderful giveaway.